Having more than ten e-mails in your in-box leads to reduced productivity, stress and inefficiency. I’m sure many of you have found techniques to get around your e-mail hoarding disorder: perhaps you do a “find” to locate an e-mail, or you leave e-mails that need action as “unread”, but I can tell you, none of these are as effective as implementing a few of these steps. 1. Turn off the notifications. I hate missing things…or the idea that it might be possible to miss something. I had all the Facebook notifications turned on and would receive an e-mail any time someone liked my status, posted on my wall, etc. But e-mail notifications are redundant if you log into the social network sites. All of them have ways of showing you the same information through alerts. I have a feeling that if you care that much about the notifications, it means you are on your social networking sites with a bit of regularity (once a week, a day, maybe even an hour), so save yourself the extra junk in your inbox. If this is too big of a jump for you, then turn off all the notifications except for direct messages, as those are the people who will be waiting for a response from you. 2. Unsubscribe, unsubscribe, unsubscribe! If you aren’t reading the blog subscriptions, if you aren’t looking through the catalogues, if you never use the coupons, then unsubscribe. If you are worried that maybe, just maybe someday you might want to read it, then save one e-mail in a “Someday” folder, unsubscribe and when you are ready, go out and re-subscribe. If this is too big of a jump for you, then set up a rule to move your subscriptions to an appropriate folder: “Blogs”, “Coupons”, “Catalogues,” etc. 3. Inbox means “Action Needed.” The only e-mails that should be in your in-box are e-mails you need to take action on: reply, review, etc. If you don’t need to take action, then file it away. Now, for those of you with thousands of e-mails in your inbox, you might have quite a few items that need action taken. What I would suggest is creating Sunday-Monday folders. File each e-mail away in the day of the week you plan to take action. Then on Mondays check the Monday folder and take the appropriate action. Tuesdays check the Tuesday folder, etc. If it’s really bad you can do 1-31 folders, which represents the day of the month. 4. Mark it as spam. If you are getting spam in your inbox, mark it as such. This way your e-mail system will get smarter and start putting those e-mails in your junk folder. 5. Help! I have thousands of e-mails, now what? 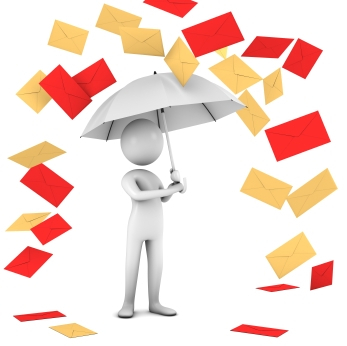 Here are a few quick tips for reducing your inbox if it’s already unmanageable. Sort by “Subject”. First sort by subject and see if you have any e-mail chains between multiple people. If you do, skim the newest response, skim the other responses to ensure all responses are in the newest e-mail, and delete all the old e-mails. Sort by “Sender”. Delete all the e-mails that are more notification type, such as, “your statement is ready for viewing”. Then check for senders that are high priority to you, and read those and either file or mark for action. Sort by “Date.” Finally sort by date, and clean up the rest of the e-mails from oldest to newest. 6. Don’t forget to use the flags! If you have a lot of e-mails that need action, you can use the follow-up or priority flags. Determine what each flag is going to mean in your system, and assign every e-mail that needs action the appropriate priority flag. I hope you will make an effort to live a cleaner and less stressful inbox life. That way on Friday you can leave work with three e-mails in your inbox, like me! It makes coming back to in on Mondays much more bearable.